Undamaged historic brick (above). Sandblasted brick (below). 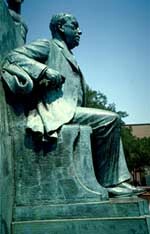 Photo: Courtesy, Illinois Historic Preservation Agency. 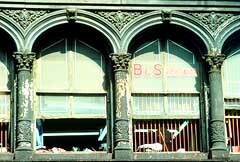 “Chemical or physical treatments, such as sandblasting, that cause damage to historic materials shall not be used. The surface cleaning of structures, if appropriate, shall be undertaken using the gentlest means possible.” —The Secretary of the Interior's Standards for Rehabilitation. 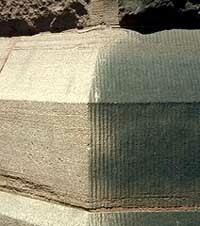 The use of water in combination with grit may also be classified as an abrasive cleaning method. Depending on the manner in which it is applied, water may soften the impact of the grit, but water that is too highly pressurized can be very abrasive. There are basically two different methods which can be referred to as "wet grit," and it is important to differentiate between the two. One technique involves the addition of a stream of water to a regular sandblasting nozzle. This is done primarily to cut down dust, and has very little, if any, effect on reducing the aggressiveness, or cutting action of the grit particles. With the second technique, a very small amount of grit is added to a pressurized water stream. This method may be controlled by regulating the amount of grit fed into the water stream, as well as the pressure of the water. Usually, an abrasive cleaning method is selected as an expeditious means of quickly removing years of dirt accumulation, unsightly stains, or deteriorating building fabric or finishes, such as stucco or paint. The fact that sandblasting is one of the best known and most readily available building cleaning treatments is probably the major reason for its frequent use. the constancy of the pressure on all surfaces during the cleaning process. Despite the apparent care taken by most architects and building cleaning contractors to prepare specifications for pressure cleaning which will not cause harm to the delicate fabric of a historic building, it is very difficult to ensure that the same amount of pressure is applied to all parts of the building. For example, if the operator of the pressure equipment stands on the ground while cleaning a two-story structure, the amount of force reaching the first story will be greater than that hitting the second story, even if the operator stands on scaffolding or in a cherry picker, because of the "line drop" in the distance from the pressure source to the nozzle. Although technically it may be possible to prepare cleaning specifications with tight controls that would eliminate all but a small margin of error, it may not be easy to find professional cleaning firms willing to work under such restrictive conditions. The fact is that many professional building cleaning firms do not really understand the extreme delicacy of historic building fabric, and how it differs from modern construction materials. Consequently, they may accept building cleaning projects for which they have no experience. Non-historic/Industrial: A representative of the building cleaning industry might consider "high" pressure water cleaning to be anything over 5,000 psi, or even as high as 10,000 to 15,000 psi! Water under this much pressure may be necessary to clean industrial structures or machinery, but would destroy most historic building materials. Industrial chemical cleaning commonly utilizes pressures between 1,000 and 2,500 psi. Decorative pressed metal interior or exterior features should not be cleaned abrasively. Photo: NPS files. Cast and wrought iron architectural elements may be gently sandblasted or abrasively cleaned using a wire brush to remove layers of paint, rust and corrosion. Sandblasting was, in fact, developed originally as an efficient maintenance procedure for engineering and industrial structures and heavy machinery--iron and steel bridges, machine tool frames, engine frames, and railroad rolling stock--in order to clean and prepare them for repainting. Because iron is hard, its surface, which is naturally somewhat uneven, will not be noticeably damaged by controlled abrasion. Such treatment will, however, result in a small amount of pitting. But this slight abrasion creates a good surface for paint, since the iron must he repainted immediately to prevent corrosion. 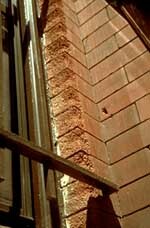 Any abrasive cleaning of metal building components will also remove the caulking from joints and around other openings. Such areas must be recaulked quickly to prevent moisture from entering and rusting the metal, or causing deterioration of other building fabric inside the structure. Those instances (generally industrial and some commercial properties), when it may be acceptable to use an abrasive treatment on the interior of historic structures have been described. 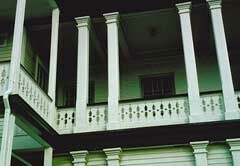 But for the majority of historic buildings, the Secretary of the Interior's Guidelines for Rehabilitation do not recommend "changing the texture of exposed wooden architectural features (including structural members) and masonry surfaces through sandblasting or use of other abrasive techniques to remove paint, discolorations and plaster. There are alternative means of removing dirt, stains and paint from historic building surfaces that can be recommended as more efficient and less destructive than abrasive techniques. The "gentlest means possible" of removing dirt from a building surface can be achieved by using a low-pressure water wash, scrubbing areas of more persistent grime with a natural bristle (never metal) brush. 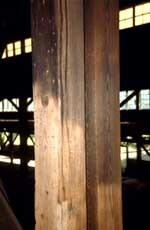 Steam cleaning can also be used effectively to clean some historic building fabric. Low-pressure water or steam will soften the dirt and cause the deposits to rise to the surface, where they can be washed away. 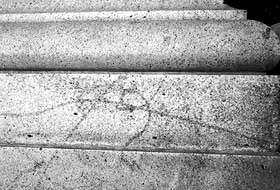 A third cleaning technique which may be recommended to remove dirt, as well as stains, graffiti or paint, involves the use of commercially available chemical cleaners or paint removers, which, when applied to masonry, loosen or dissolve the dirt or stains. These cleaning agents may be used in combination with water or steam, followed by a clear water wash to remove the residue of dirt and the chemical cleaners from the masonry. A natural bristle brush may also facilitate this type of chemically assisted cleaning, particularly in areas of heavy dirt deposits or stains, and a wooden scraper can be useful in removing thick encrustations of soot. A limewash or absorbent talc, whiting or clay poultice with a solvent can be used effectively to draw out salts or stains from the surface of the selected areas of a building facade. It is almost impossible to remove paint from masonry surfaces without causing some damage to the masonry, and it is best to leave the surfaces as they are or repaint them if necessary. There are certain restoration measures which can be adopted to help preserve a historic building exterior which has been damaged by abrasive methods. Wood that has been sandblasted will exhibit a frayed or "fuzzed" surface, or a harder wood will have an exaggerated raised grain. The only way to remove this rough surface or to smooth the grain is by laborious sanding. Sandblasted wood, unless it has been extensively sanded, serves as a dustcatcher, will weather faster, and will present a continuing and ever worsening maintenance problem. Such wood, after sanding, should be painted or given a clear surface coating to protect the wood, and allow for somewhat easier maintenance. This Preservation Brief was written by Anne E. Grimmer, Architectural Historian, Technical Preservation Services Division. Valuable suggestions and comments were made by Hugh C. Miller, AIA, Washington, D.C.; Martin E. Weaver, Ottawa, Ontario, Canada; Terry Bryant, Downers Grove, Illinois; Daniel C. Cammer, McLean, Virginia; and the professional staff of Technical Preservation Services Division. Deborah Cooney edited the final manuscript. The illustrations for this brief not specifically credited are from the files of the Technical Preservation Services Division. Brick Institute of America. 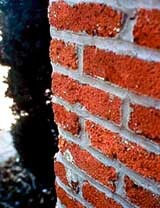 Colorless Coatings for Brick Masonry. Technical Notes on Brick Construction. Number 7E (September/October 1976). ____________. "Removing Stains from Masonry." The Old House Journal. V:5 (May 1977), pp. 58-59. ___________. Exterior Cleaning of Historic Masonry Buildings. Draft. 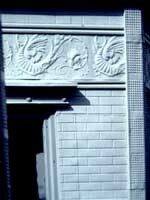 Washington, D.C.: Office of Archeology and Historic Preservation, Heritage Conservation and Recreation Service, U.S. Department of the Interior, 1976.